COMPILED FOR THE BEST AND MOST AUTHENTIC SOURCES. 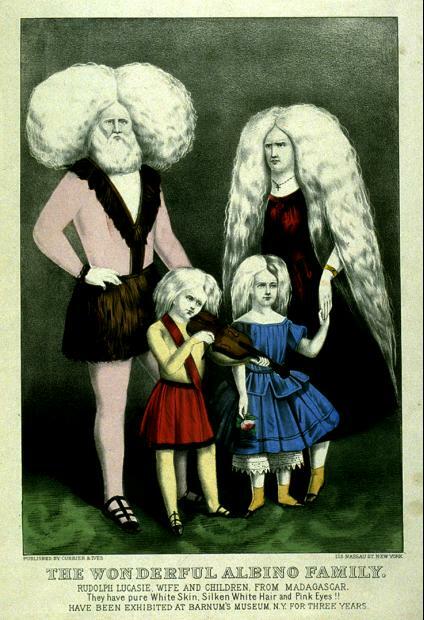 ON EXHIBITION AT BARNUM'S AMERICAN MUSEUM. 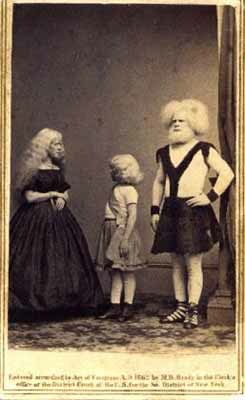 This splendid and handsome specimen of the human variety, known as Albino, was born of dark parents, at Iranque, on the east coast of the island of Madagascar. On the 27th of June, 1824, Captain Don Carlos Sieras, a native of Portugal, and the master of a merchant vessel, being short of water, was compelled to land on this coast. Several of the crew went on shore, where they discovered a number of negroes in the act of carrying off an Albino of about five years old. The child had already been wounded in several places ; indeed, the mark of one lance-wound he then received is still plainly apparent on the left side of his neck. After a desperate and prolonged conflict, in which several of the natives were killed, and others put to flight, the brave sailors succeeded in saving the boy, whom they placed in security on board their vessel. The Captain, being greatly interested in and pleased with the youth, had his wounds attended to, and retained him on board until he was about to sail for Europe. This kind sailor afterwards conveyed the boy to his native town, Lenabon, and maintained him for an entire year in his own house. Sometime afterwards, Don Carlos Sieras, being compelled to visit Rome, made the boy accompany him thither, where he was introduced into the Convent of St. Maria Maggiore, for the purpose of being instructed in the rudiments of the Catholic religion, as well as the Italian language. Of course, no one could understand the youth; so that, at first, an almost insurmountable obstacle presented itself in the way of his mental progress. Several learned professors, skilled in Arabic and other Oriental tongues, were consulted, but without any beneficial or satisfactory result. The boy could only be got to articulate a few simple nasal or guttural sounds. After an immense amount of perseverance, and no ordinary degree of patience, the youth at length acquired an imperfect knowledge of Italian; and, when sufficiently instructed in the principles of the Christian religion, was baptized in the Church of St. Johann Lateran, at Rome, A. D. 1829, five years after his miraculous escape from death; on which occasion he received at the font the name of Rudolph Lucasie. 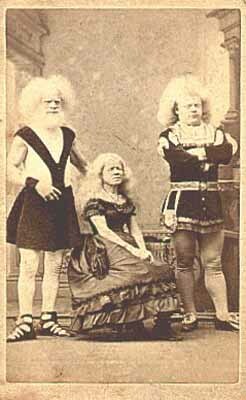 The wife of Rudolph Lucasie, also a pure Albino, Ajntiania Lali, was born in Modena, African descent. She has three brothers and four sisters, all of whom are black; have curly black hair, or wool, thick lips, flat noses, and all the other peculiarities of the African race, indicating, beyond the possibility of doubt, their pure African descent. 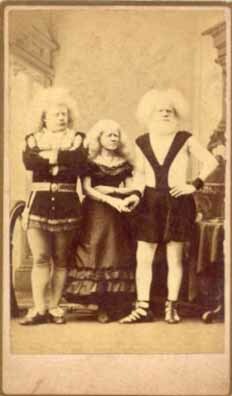 She met her husband for the first time in Venice in 1848, when their remarkable similarity of parentage and peculiarities gave rise to an early matrimonial alliance, which has resulted in the birth of five children, all of whom have exhibited the same traces of Albinoism as their parents. But one of the number is now living� Joseph Lucasie, a sprightly, interesting lad of six years, who was born at the city of Hamburg, Germany, and who possesses the same interesting characteristics as his parents�perfectly pure white skin, abundant white silky hair, and pink eyes: the pupil of his eye, instead of being round, like that of other people's, is angular, nearly square. Taken all together, this Albino Family is the most interesting case of Albinoism that has ever been brought to the notice of the American public. 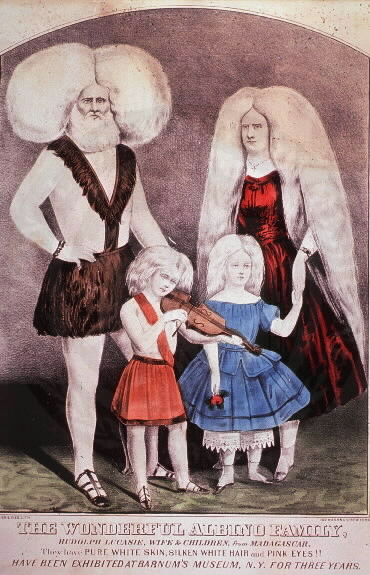 It is not unusual for single cases, more or less marked, to occur, but this is the only case known of a husband and wife, both born of perfectly black parents, exhibiting such marked traits of Albinoism, with a child of the same interesting and wonderful peculiarities. consequently, the complexion is black also. According to Dr. Prichard, when this variety springs up among negroes, the woolly excrescence which covers the heads of that race is white. The rose color of the iris and pupil in the Albino is traceable to a like cause, viz. : the absence of the dark mucous substance, known as the pigmentiim nigrum, from which, in the eyes of those who are not Albinos, is spread over the choroid coat of the eye and the iris, and occurs about the fifth week after conception. Whether the darkness of the pigment is occasioned by its decomposing the more active portion of the light which falls upon it, and thus defending the parts that are below, is a point that is difficult to sustain ; although we all know that the darkest eyes are best able to endure the light, which ought to be the very opposite effect of the dark color, if there were no specific action in the pigment itself. Buzzi, surgeon to the hospital at Milan, was the first anatomist who demonstrated that the color of the skin is owing to the imperfection or the absence of one of the three parts of which the skins of ordinary human beings are composed. But what is it that thus impairs or destroys the rete mucosum in such persons? Science has not yet answered that question. A singular fact, however, is related by M. Buzzi, which, although it does not explain, nevertheless seems to throw some light on this subject: "A woman of Milan, named Calcagni, had seven sons. The two oldest had brown hair and black eyes; the three next had white skins, white hair, and red eyes ; the two last resembled the two eldest. It was said that this woman, during the three pregnancies that produced the Albinos, had a continual and immoderate appetite for milk, which she imbibed in large quantities; but that this disposition did not exist during the other four periods of gestation. It is not, however, ascertained that this preternatural appetite was not itself the effect of a certain heat, or internal disease, which destroyed the rete mucosum in the children before their birth. But human beings are not the only animals among whom Albinos appear. This [remarkable natural phenomenon is likewise occasionally met with in the elephant, the rhinoceros, the sheep, pig, horse, cow, dog, cat, and numerous other animals, and even birds ; and where this occurs the same corresponding colors of the skin and eyes are observable. In the Natural History Collection, at Barnum's American Museum, New York, there are exhibited Albino crows, Albino robins, Albino black-birds, Albino rats, &c, &c, which have been collected in a separate case and marked, " Case of Albino animals and birds," and is an object of considerable interest to the curious, and to students of natural history. 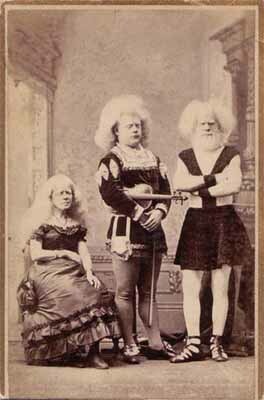 In 1844, Mr. Barnum presented Queen Victoria with a living Albino Deer, which her Majesty sent to the Royal Zoological Gardens, Regent's Park, where it attracted the public curiosity for several years. Among the cold-blooded animals no Albinos have been found ; or at least any traces which have been observed in them have been directly referrable to disease: whereas in the Albinoism of the warm-blooded animals there exists no disease whatever. As far as can be judged from external appearance, and from their accounts of their own feelings, Albinos appear perfectly healthy, and do not exhibit a single mark of disease. That Albinoism is owing to the absence of the mucous tissue is further proved by the results of those wounds in the skin by which that tissue is topically destroyed. Thus a surface wound upon the finger, especially if it be kept for some time in a state of irritation, will produce a white mark on the nail. Galling the back of a horse also produces white hair after the wound heals, even although the color has been originally deep black. Jockeys sometimes produce a white spot on the forehead of the horse, by destroying the tissue in question with a red-hot iron. This they do by way of ornament to the horse's head. Unquestionably much inconvenience arises from the conformation of the eye peculiar to the Albinos. A strong light cannot be borne, and the glare of day excites no small degree of uneasiness. Hence, the eyelids are drawn completely over the balls of the eyes, which are weak, tender, and watery. To this class vision is always most perfect and agreeable during twilight. A white mouse, possessed by Blumenbach, manifested the same inability to bear the light which has been observed in the human examples. In the Opuscoli Scelti de Milan, 1784 (tom, vii, p. 11), M. Buzzi, an eleve of the celebrated anatomist, Moscati, published a very interesting memoir, wherein he demonstrates, by dissection, what Blumenbach had merely supposed relative . to the proximate cause of the extraordinary physical appearance of this human variety : A peasant, about 30 years old, died in the hospital of Milan of a pulmonary disorder. His body, being exposed to view, was exceedingly remarkable by the uncommon whiteness of the skin, of the hair, of the beard, and of all the other covered parts of the body. M. Buzzi, who had long desired an opportunity of dissecting such a subject, immediately seized upon this. He found the iris of the eyes perfectly white, and the pupil of a rose color. The eyes were dissected with the greatest possible care, and were found entirely destitute of that black membrane which anatomists call the cornea; it was not observable, either behind the iris or under the retina. Within the eye there was found only the choroid coat, extremely thin, and tinged with a pale red color, by vessels covered with discolored blood. What was more extraordinary, the skin, when detached from several parts of the body, seemed almost entirely divested of the rete mucosum; maceration did not discover the least vestige of this, not even in the wrinkles of the abdomen, where it is most abundant and most visible.